In the early days of automobile production, folks were still scratching their heads about how to use a horseless carriage. Was it for a nice day out, a way to get a doctor to a sick child, a showy display of wealth, or help around the farm? And how was its reliability? There was no standardization on design, parts, or sizes. Some cars were powered by steam or electricity, others by gasoline — a real challenge since there were no gas stations and gas wasn't readily available. There were few roads and those that did exist were uneven, muddy, rutted, or dotted with tree trunks. Potholes as broad as 40 to 50 feet were reported. Mechanical breakdowns were commonplace and there were no garages offering assistance. Lots of inventors tried their hand at making improvements to early autos but road conditions beat cars up pretty badly and the models produced were often irreparably damaged and/or obsolete after only a year on the road. Enter Henry K. Holsman, successful Chicago architect who'd bought two different cars from the East, tinkered with them, and still found them lacking. With a flair for mechanics, in 1901 he designed and built the Highwheeler, a model with carriage construction and wagon-type wheels that could cover bumpy ground. He started the Holsman Automobile Company in 1902 and produced one of the first mass-produced motor vehicles with this motto: "High Wheels Travel All Roads Because All Roads Are Made To Be Traveled By High Wheels". His goal was to produce a sturdy, reliable, and affordable car for the working class. Over the years he offered his souped-up farm buggy in several versions but most popular were the two-passenger runabout and the four-passenger, two-seat surrey with a longer body, longer wheelbase and different spring suspension. The buggy ran on narrow, wooden hub and spoke wheels several inches higher in the back than in the front ( 48" rear, 44" front) with solid rubber tires 1-1/4 inches thick. Its high wheels provided an 18-inch clearance. The chassis was made of wood with flat steel bracing, and the buggy was powered by a two-cylinder, four cycle, air-cooled engine rated at 5 hp until 1904, and at 7hp (1904), 10hp (1905-09), 12hp and 4-cylinder, 26 HP (1920) thereafter. The engine was situated under the seat with the gas tank behind the driver. Its drive train used chains and sprockets to an idler shaft and hemp rope to the rear wheels. Because the rope cable slipped badly on rainy days, by 1906 Holsman and one of his fishing buddies had developed a braided steel wire chain cable to replace it; later still a regular chain was used. It had a 75 to 80" wheelbase and suspension was managed with front and rear elliptical springs. Hand-cranked ignition was via a double vibrating coil and dry batteries but if that didn't work or the engine sputtered to a stop, there was a failsafe. The driver could pull out the toolbox located under the floor just behind the dash and start to work — or, by means of hooks attached to the front axle, the vehicle could be horse-towed. A single vertical tiller operated the controls, including 2 forward gears and the first-ever reverse gear. To start the car the driver pulled a handle towards him and applied pressure to determine speed. To shift gears the driver, running at very low idle, timed the gear change between engine power strokes. The best-selling model used the piano box-type body. 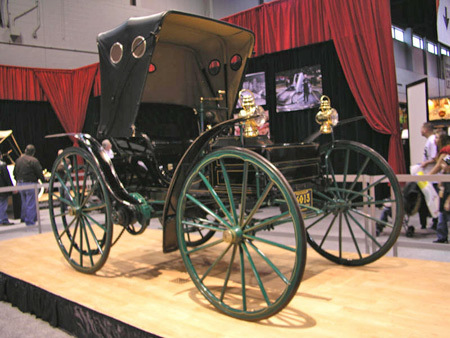 Exterior colors were black or dark green with a red pinstripe and patent-leather covered iron fenders and mudguards set the buggy off. There was a rubber floor mat and, in later years, a horn and two brass side kerosene lamps to light the road. What was missing was any cable drive, differential, clutch, pedals, or radiator. Models weighed between 500 and 1200 pounds, including gravity-fed gas tanks that held between 5 and 7 gallons. The Highwheelers probably did their best at roughly 10 mph but were said to reach 25-30 mph. Prices for these cars generally ranged from $500 to $1050 over the years with sales as far away as New Zealand. By far the greatest number of sales, however, was made in the Midwest. In the time he produced these buggies Holsman built more than 6000 vehicles and secured more than twenty automotive engineering patents. His most successful year, with production of nearly 1500 cars, came in 1906. In 1910, despite the fact that the company still had many orders, the Holsman Company's bank loan came due and the bank would not lend the additional funds needed to continue in production. The company went into receivership and the plant closed. 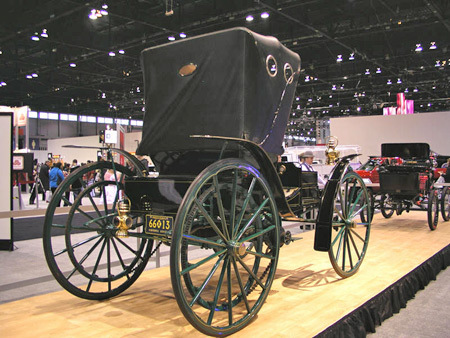 The four dominant brands of high-wheelers, 18,000 of which were produced in the early 1900s, had been International Harvester, Staver Carriage, Sears (sold through their catalogue and delivered by rail), and Holsman. When Holsman closed its doors, it sold its patents to International Harvester which hired Holsman to oversee production. He did so for two years. By 1908, however, Ford's smaller-wheeled Model T, more effective for city driving, began its ascendancy. It was only a matter of time before the immensely popular Model T spelled the end of the Highwheelers. Photos for this article courtesy of Illinois Chapter of AACA.